ACT scores continue to inch up at CPS. THE LOOP — Mayor Rahm Emanuel is touting steady improvement in ACT scores for juniors in Chicago Public Schools. According to CPS, Chicago students set a record for the highest ACT average last year, and that record figures to stand for a while as the district is shifting along with the rest of the state to the SAT. The average junior's score on the widely accepted college application exam rose to 18.4 last year, up from 18.2 the year before. "Chicago’s schools are realizing record-high academic achievements — progress that could not be made if it were not for the commitment by our students, teachers, parents and principals,” Emanuel said in a statement. “Our continuously rising ACT scores signal that more of our students are not only college-ready than ever before, but that their hard work is paying off and opening doors to even more academic options once they graduate." Mayor Rahm Emanuel and CPS CEO Forrest Claypool are touting record-high ACT scores — a record that figures to stand as the district shifts to the SAT this year. 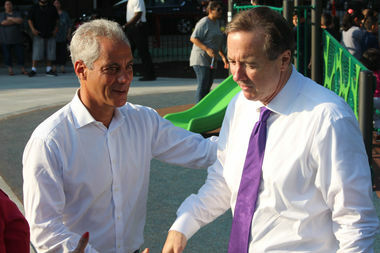 The Mayor's Press Office also boasted of a 1.2-point increase on average scores during Emanuel's tenure since 2011. In the five years before that, the average score rose just 0.2 points. 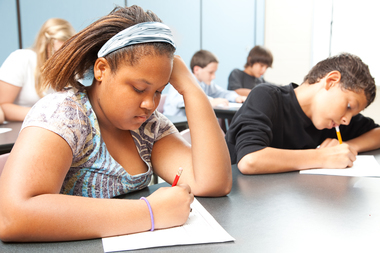 According to ACT, the average score for the test nationwide for the last three years was 20. The highest cumulative score is 36. Even so, Emanuel called it "yet another indication that our schools are on the right track, and that the future for our students is bright." The Emanuel administration touted the score improvement alongside other recent gains at CPS, including a record-high graduation rate (73.5 percent), freshman on-track rate (87.4 percent) and attendance rate (93.4 percent). "The ACT scores announced today are yet another indication that CPS students are performing better than ever and are increasingly qualified for college success,” said CPS Chief Executive Officer Forrest Claypool. “Our students, parents and educators deserve to be applauded for their continued growth, and as a district we are committed to providing them with the tools, resources and strategies needed to continue their impressive gains." Those gains, however, will have to be measured in other ways. Earlier this year, in a money-saving move after bids were put out, the Illinois State Board of Education decided to shift state testing of juniors to the SAT, generally preferred by private schools and colleges on both coasts, while the ACT has traditionally been more popular in the Midwest. CPS will follow suit.